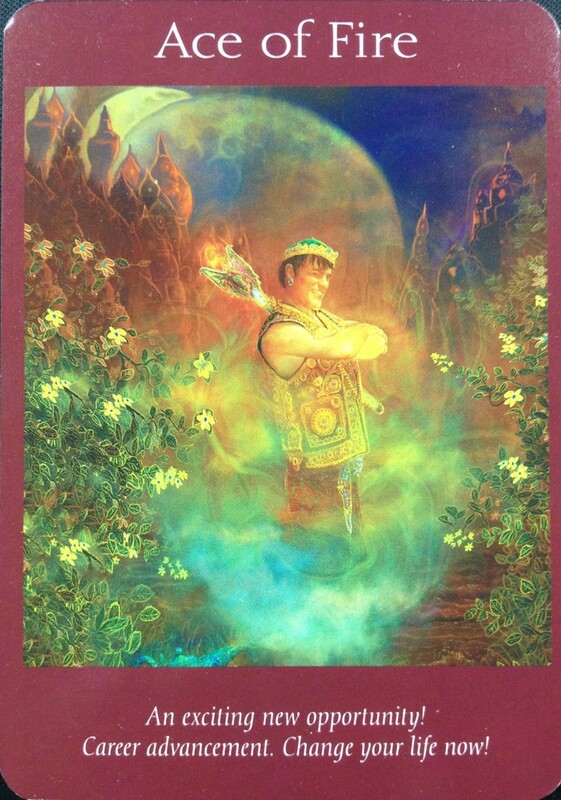 Card: Ace of Fire – from the Angel Tarot Cards by Doreen Virtue and Radleigh Valentine. Message from The Faeries: From the ashes of the fire, a phoenix is born. This a time of great change and transformation. Some of you may have been experiences some challenges in the past few weeks, but have no fears because this week is a week where things are changing for the better. As you have you worked your way through these challenging few weeks, you now find yourself turning a corner. Imagine your personal story-line to be like a book, and now you can turn the page to a fresh, blank page and start a new chapter. As you begin this new chapter in your life, we ask you: What do you want this new chapter to look like? What kind of story are you going to write for yourself? Is it going to be a romance? Is it going to be an adventure? Is it going to have a happy ending? Sometimes it seems as though your story writes itself, and this is true because this is how you allow your story to unfold. There is absolutely nothing wrong with this. You are going with the flow and watching the pages turn with eager anticipation, just like the rest of are doing as we observe you go through your life’s journey. You don’t know what will happen from one moment to the next, and this is perhaps something that makes life quite mysterious and amazing, but here is a hint: You’ve actually been writing your story all along. Or rather, you are the co-author of your story, as each and every one of you are writing this story together. Now that you know that you are the author of your life-story, we hope that you eagerly pick up that pen and write yourself some amazing chapters. This week, as you have started a fresh page for yourself, we hope that you think of something new for you to experience. Look at the man standing in the card. Think of him to be like your own personal genie, and he is going to grant you your wish. Whatever story you write for yourself is going to come true! We hope you write yourself your best life-chapter so far. Be creative and have lots of fun! This entry was posted in Faerie Reading and tagged Faeries, fairy, new chapter, Oracle, Tarot, Tarot Reading by faeriemessenger. Bookmark the permalink.